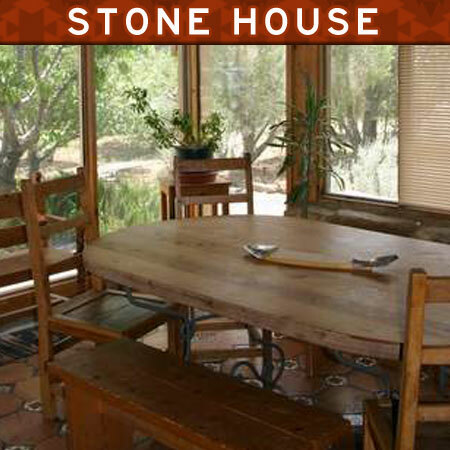 Your Home Base for Fishing the San Juan River! 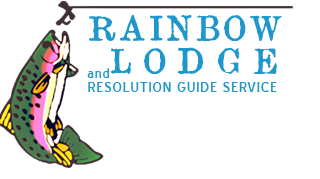 All-Inclusive San Juan River fishing getaway that includes guided fishing, comfortable accommodations and gourmet meals prepared just for you. The Rainbow Lodge sits on the banks of the San Juan River in New Mexico, just downstream from the town of Navajo Dam, New Mexico. 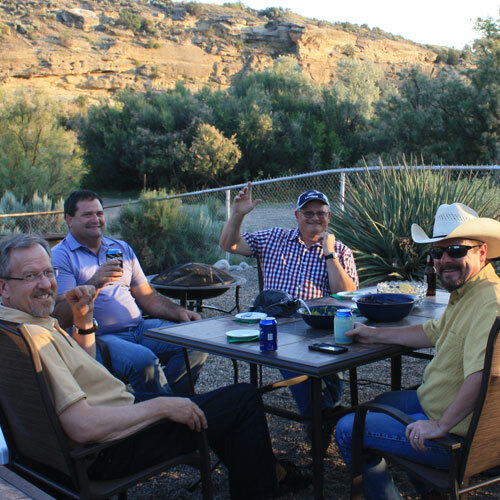 From our lodge you can walk out the back gate and have access to over 7 wonderful miles of the San Juan River with uninterrupted access and no rod fees. Summer dry fly fishing on the San Juan River is great right out back of your suite! Jump into your day of San Juan River fishing by comfortably sliding into your waders right in the comfort of your own tiled entry room. After an exciting day of fishing on the San Juan, you can clean up for a gourmet meal with a hot shower in your private bathroom or just relax with a cold drink in your living room. 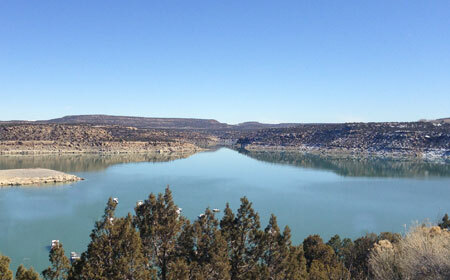 Learn More About the Ultimate San Juan River Fishing Getaway! The ONLY San Juan River Lodge on Public Waters! 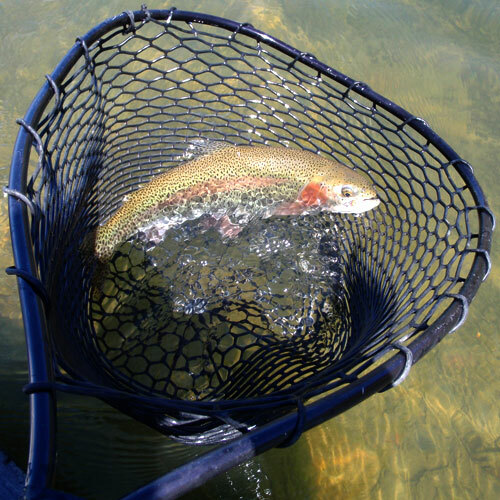 World Class Trout Fishing right from your backyard. You can take a short walk from your room and in less than 2 minutes you will be fishing on the San Juan River with access to 7 miles of world-class trout fishing on the San Juan River with no rod fees. No other lodge offers this type of access to the San Juan River, not to mention our world class San Juan River fly fishing guide services included with selected packages. 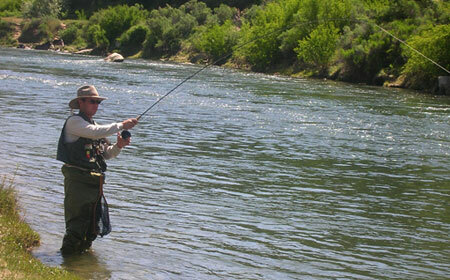 Learn More About Fishing the San Juan River Here! A lodge built for fishermen! Newly tiled entryways to change in and out of your waders and hang your equipment. A large living room to relax after a day of fishing and share stories. Each suite features two bedrooms sleeping a total of 4 anglers comfortably. Everything you need is provided from meals to gear. “ALL YOU GOTTA DO IS GET HERE” is not just our slogan, it’s our promise! Gourmet Meals Included with Your Stay! The Rainbow Lodge will feed you like a king (or queen), providing all your meals from a hearty breakfast to a lunch on the water and Five Star Dining in the evening. 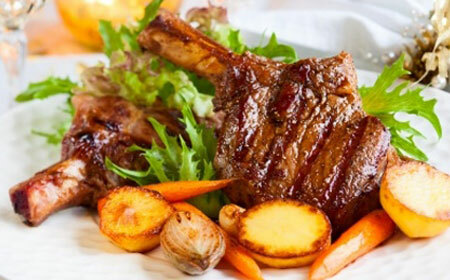 We have a professional on-site chef who is ready to cater to your dining needs from morning to night. Have a special request or diet? No problem! Relax, have fun, & catch some fish we will make sure your belly is satisfied! 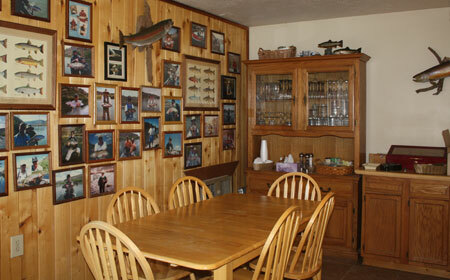 We offer packages to accomodate a single angler or an entire family. Beginner or expert, we know the places to catch fish and can gurantee you will never have a boring day! We not only fish the famous San Juan River, but also offer popular guided fishing adventures on Navajo Lake, which is a favorite fishing destination amongst our guests and anglers worldwide. Mix up your vacation and catch Trout, Bass, Crappies, Pike, & Carp on our professionally guided fishing adventures on Navajo Lake. The Rainbow Lodge may very well be one of the best trout fishing destinations in the world and anglers come from everywhere to experience fishing the Quality Waters of the San Juan River. Many of our fishing clients don't realize we are located in the middle of a virtual wonderland of recreation and entertainment! 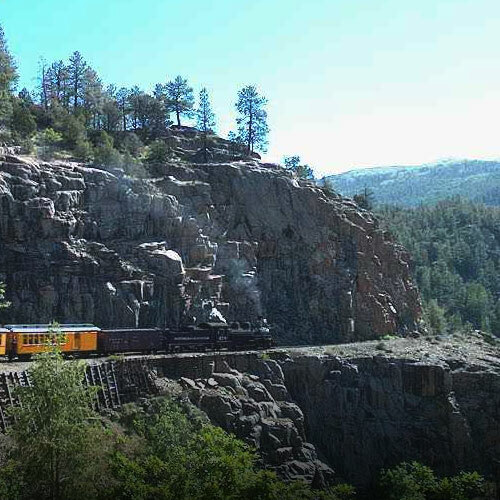 Within a short drive from the lodge you can find epic New Mexico mountain bike trails, Aztec ruins, Casinos, hiking, wine tasting and the famous Durngo-Silverton Train which is popular among families staying at the lodge. 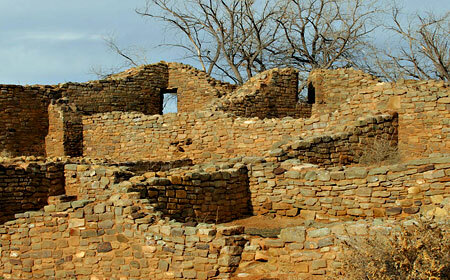 Explore the San Juan River Area Here!